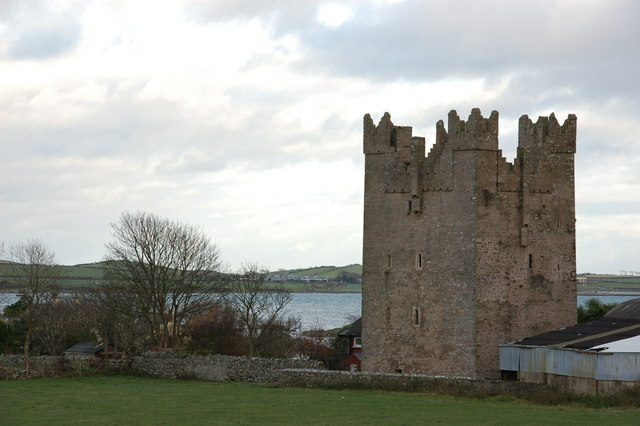 Notes: Kilclief Castle (Irish: Caislean Cill Cleithe) (Ordnance Survey ref: J597457) is a tower-house castle beside Strangford Lough and 2.5 miles (4 km) south of the village of Strangford, County Down, Northern Ireland. Kilclief is a hamlet of historical value on the Strangford to Ardglass road. This kind of tower-house is sometimes called the gatehouse type, because of its similarity to a castle gatehouse. It is among the oldest tower houses in Lecale. Kilclief Castle tower house is a State Care Historic Monument in the townland of Kilclief, in Down District Council area, at grid ref: J5972 4575. "Kilclief Castle". web.archive.org. Archived from the original on 2005-08-18. Retrieved 2010-01-14.